Wow, I had such an amazing Thanksgiving Break but I have seriously missed you guys! Last week was so relaxing and I loved every second of it. First Vegas with the hubby, then Thanksgiving with my in-laws, then we went straight into Christmas. This weekend we took our annual trip to our favorite tree farm and cut down our Christmas tree. It was the first year Miss E was aware of the whole process and she was quite the helper. The cutest part was, after my husband cut down our tree she walked right over and sat on the stump like that was the whole point of cutting down the tree.. so she could have her own little seat. So cute. Makes my heart melt. This weekend was also spent decorating our house for the holidays. It’s not even close to being done yet and I think I added about 15 projects to my ‘to-do’ list, but I did mange to complete a few new things…. just a few. Remember my Fall Twig Wreath I shared a few months ago? Well, it got winterized this weekend! Here is my Winter Twig Wreath. 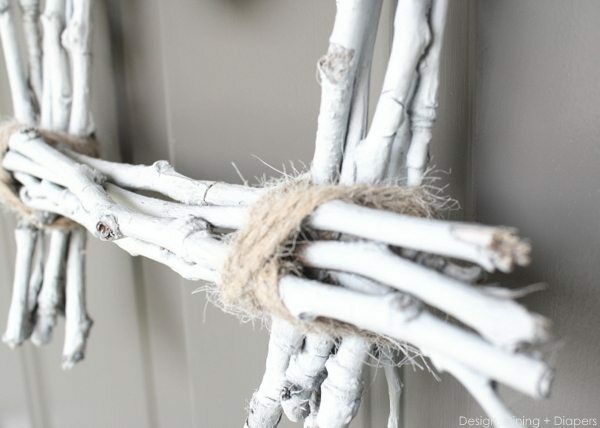 After I posted by Fall Twig Wreath, Lucy gave me the idea of painting it white for Winter and I decided to go for it. 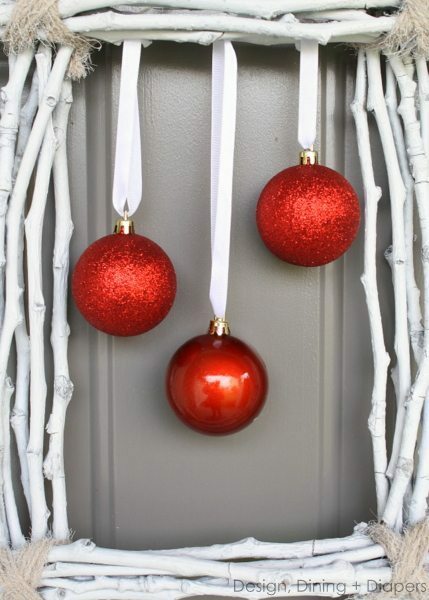 I’m adding a lot of red to my holiday decor this year and I loved the contrast of the white twigs and the red ornaments. I used a can of basic white spray paint on the wreath and let it dry overnight. It was so simple and it completely transformed the look of the wreath. The red ornaments came from The Dollar Tree. Seriously, I love the Dollar Tree. Love. You can view a tutorial for this wreath here. Have you made your winter wreath for this year yet? I am so EXCITED!!! I made the fall wreath and was going to pack it away and then i saw THIS!!! Super cute! Is it bad that I used a store-bought swag this year? It’s not my normal but it reduced my stress a ton to be able to just STICK IT UP there and have it be decorated. :) I love this one! It looks great with it’s new winter coat! 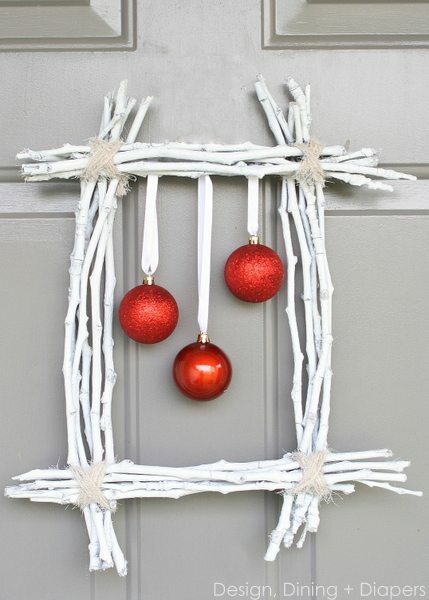 Your winter wreath is so pretty, white sticks with red ornies. Love the simplicity and contrast. I took my fall wreath apart that I tried to copy from yours. Just might have to try it again making one similar to yours. I had all my old faux pine garlands out today but then hubs decided to make trees with tomato cages.. He snagged all my garlands and whatever else he thought he might need. So lovely!!! Thanks so much for sharing ! I’d love for you to visit my blog. 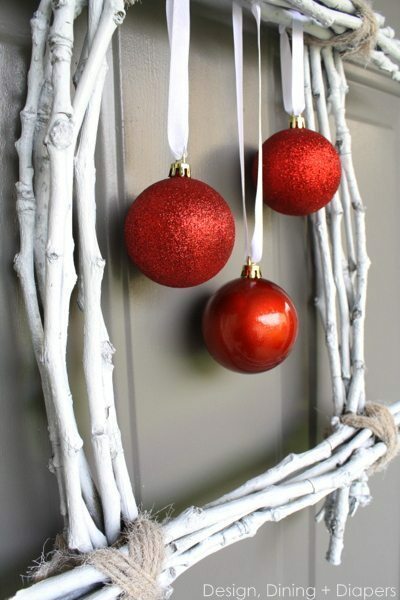 Love the holiday-ed version of your twig wreath! I love this take on a winter wreath! The red balls are great for Christmas and you could take them off and put pine cones on to last the rest of the winter. Thanks for sharing. how perfect is that?! love it! Great way to re-use your fall decor! I love the pop of red with the white. They look stunning against your gray door! So good to hear you had a wonderful Thanksgiving break! I loved your fall twig wreath and this winter one? Adore! So I pinned it! I love your wreath! It’s so pretty. Plus I’m a BIG fan of red and white for Christmas so this is perfect in my book! It’s like rustic glam! Love it. How cute and creative! I found you from the link party over at The 36th Avenue. This wreath is so cool, cute, and unique! I love it! This is officially my new favorite wreath of the season! Absolutely beautiful! Love the look of this. I like that it’s not your typical wreath. It’s such a unique but classy design. You always rock!!! I love all you do!!! Love the wreath and I wanted to tell you to link it up next week for the Christmas wreath challenge on The CSI Project. The link up starts Wednesday. I just love everything about your wreath! This is so beautiful! I love the combination of rustic and fresh! I love this Taryn! It’s simple, modern and looks great against your gray door! 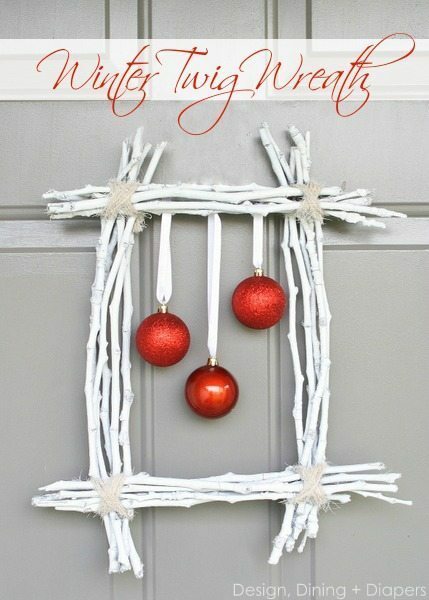 What a cute idea for a wreath–I love the square shape, the simple lines, and bright cheery red–it’s beautiful! Simple, cute and easy! My favorite kind of project! LOVE this! It’s so simple and wonderful! Super cute! That twig wreath could be transitioned for every season. Great idea! I love how Non-traditional this is!